Here are two of my DIY Electronic Christmas trees. The first one was made two years ago for an office Christmas decorating contest. I decided to update it this year with a little more modern technology. The ornaments on this tree are old ICs that were spray painted white and red. I am happy to report that I did win the decorating contest with this effort. I was going for an ‘electronic steampunk’ theme, which I think this captured. Charles even said that it looked ‘old school’, high praise indeed! This year, I updated the original tree with a Bluetooth LED controller instead of the discreet ICs of the original version. I decided since now that it is 2016 and all of the box stores sell LED light strands and power strips with embedded Bluetooth controllers and their own ‘app for that’, my entry should reflect that technology. 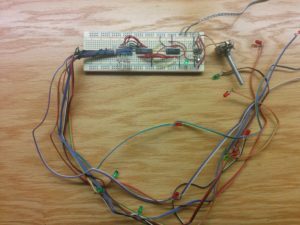 I thought about using a Raspberry PI and writing some PWM code in python to blink and dim the LEDs (and send tweets too! ), but I decided that was a bit overkill. I settled instead on a standalone Bluetooth LED controller (BL 370) that I bought for $25 on A-Maze-On. The device is made to control RGB LED strips, but I thought it would do fine driving 6 each red, green, and blue LEDs for my Christmas tree (Note that there is a 470 ohm resistor inline with each LED; I re-wired them after taking the pictures). The device has its own app called ‘Magic Light BLE’ for Android and IOS. The app works pretty well with lots of options to blink the lights. The only downside is that it seems like a fairly dodgy app since now on Android it requires location permission to start. So I borrowed my Mom’s old iPhone to load the app instead. While sitting next to the tree, the phone actually complements this years theme of ‘App for that Christmas tree’. Any suggestions on what to use for ornaments? Maybe of bunch of cut off USB connectors if I can find a ready supply?